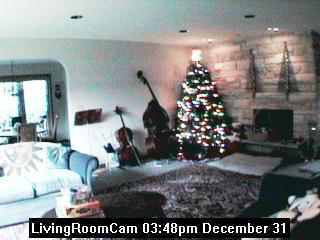 Previously, the LivingRoomCam displayed the domestic habitation of an American family. With the coming of the Christmas season, decorations and the holiday spirit fill the house to convert this into the sixth Christmas Cam. We're certainly one of the real Old Timers when it comes to home cams on the Web. We have the Christmas lights up on the house and the tree is going up on December 9th. Our tradition is to open presents on Christmas morning, so stop by and enjoy the spirit and meaning of Christmas with us. This being the fifth Christmas Cam, you can check out ChristmasCam 1995, ChristmasCam 1996, ChristmasCam 1997 , ChristmasCam 1998 and ChristmasCam 1999 pages. In 1995, we even caught Santa Claus (RealMedia video) . While waiting for Christmas, send us email and enjoy relaxing at our house. The image is updated about once a minute. 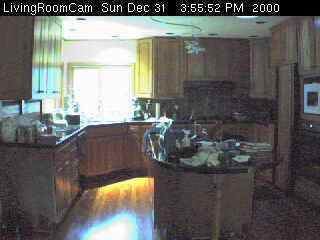 I have two cameras -- one in the living room where the tree will go up and one in the kitchen where everybody tends to hang out. I've started leaving a light on at night so the people on the other side of the planet have something to look at besides black. I also collect one image an hour for the last 24 hours . Our family's normal home is on Teleport. Check out The Adams Page and especially the Adams Trip Around America . Presents have been ripped open and the kids (of all ages) are off playing with their toys. Check out our new look in the new year. The tree is up! Merry Christmas! We will have family over on Sunday evening (17th) to finish decorating the tree. Stop by. Christmas is just around the corner! We will be getting the Christmas tree on Saturday the 9th. Decorations are going up outside and inside. I also have a new domain: http://www.ChristmasCam.cx . That's with Christmas Island. Appropriate, no? I have been rather negligent at keeping up the site, but now I need to get ready for this year's ChristmasCam! Maybe a camera in the Christmas tree? The kitchen is finished so I need to mount the camera so you can see more. And the livingroom is fuzzy. I need to look into that, too. NOTE TO THE CRIMINALLY INCLINED: our house has an alarm (door and window sensors and motion detectors) and we live in a small town whose cops actually show up in five minutes. So, save us both a lot of trouble, and don't even bother. Do you have a WebCam? JOIN the Ring! This site is owned by MisterBlue This Cool Webcam site owned by MisterBlue. I started this web page over four years ago when cameras were new and connectivity was hard -- I was one of the first. But things have changed over the years and, today, anyone can put their home onto a web page. Companies like Axis and software like WebCam32 makes putting your personal space on the web possible for just a few hundred dollars. The original hardware and software that makes this work description of LivingRoomCam is being replaced with a better solution. A good resource is the About.com forum on Net Conferencing. Check it out. They give pointers to software, how to's and lots of pointers to other cams. Connectix has a simple, easy to install digital camera that does not require a capture board. You won't be able to record videos or capture from another video source (like I did for our Trip Around America) but you will have a video camera for video conferencing or capturing your space. Intel's USB camera Pro allows you to capture video (like from your camcorder) as well as acting as a camera and I found it really easy to install and use. A really neat device is the Axis camera that sits on your home network and serves up JPEGs. It will even do streaming video. I use an Axis camera in the kitchen. WebCam32 is a shareware program that can capture a video image and then phone up your ISP (internet service provider) and FTP the image to their server. So, you can easily set up a web page that is updated once every five or fifteen minute. This is a cool, flexible program and registration is only $25 -- you should pay for this shareware, the author has earned it. This software will even capture AVI's like I created, act as an HTTP server, and work through firewalls. NovaSoft has a cool, wireless, miniature, battery powered video camera for only $299. I don't even want to think about some of the uses for this. Best experienced with Click Here to start.